Taken with Olympus E500 digital camera January 5th 2009. Click image for larger view. We have had a very cold period here in the southeastern part of Norway with temperatures down to -18C (-0.4F) and the cold weather created tons of beautiful ice crystals. Here I have photographed a big one that the sun shone on creating nice, shimmering light. I recommend that you click on the image and view it large to see more of the fantastic details in the snow crystal(s). 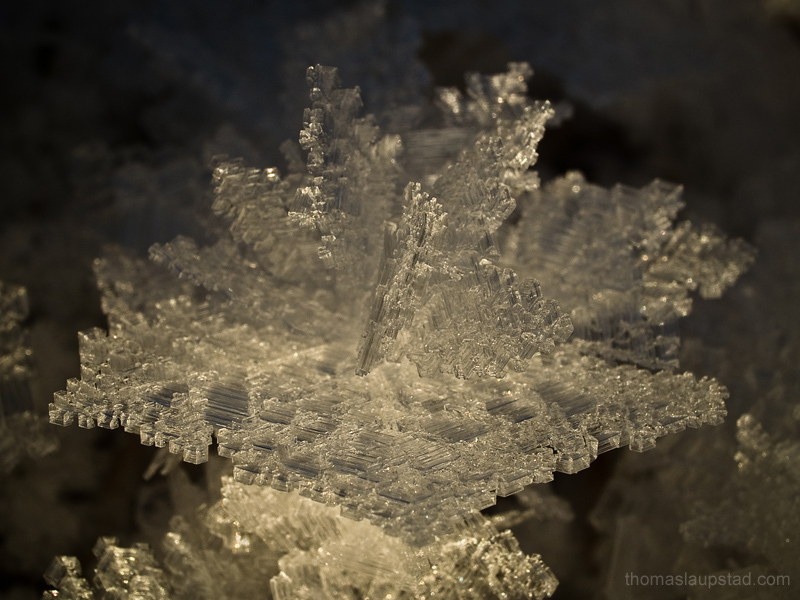 Note: The photo of the ice crystal was taken in the southeastern part of Norway. Check out this image of ice crystals forming on a branch. What a beautiful photograph of the ice crystal. I have always enjoyed your photography work. Keep more photos coming to your blog please. How well you have capture the beauty of an ice crystal! Btw: Could I ask for your vote for Best European Blog? Great shot with excellent DOF. I like it very much, you have beautiful photos. What fabulous photo of an ice crystal. Thank you for bringing it to our attention. It is an outstanding photo! Stay warm! Outstanding, Thomas. What a stunning image! You take such gorgeous pictures. it’s obvious that Nature is pure geometry and beauty! thx for this photo! Nature is beauty in its purist form. Excellent photo Thomas. Thank you so much for sharing it with all of us. What a cool picture. Have you seen this by the way? Fantastic cool picture! I don’t think I got any chance to take this type of beautiful photo as I am living in a tropical country. I just can’t imagine how I am going to be in such situation of -18c temperature. I may be …..I feel I can’t write anything as it is too cool. Love the details and crisp colours. Wow, what a stunning photograph. That is some great details you have in that snowflake. It is amazing each one has a different shape. Mother nature really knows how to create beauty. Hi, you have a great blog, I like the photographs, they are amazing. This is a great photo, its very sharp. I use the same camera and its always nice to see examples of other peoples photographs with similar equipment. Nydelig bilde. Lenge siden jeg har kikket pÃ¥ siden din nÃ¥. Du er flink!! Really nice photo. I have just bought the 35mm 3.5 macro lens for my E-500. So I am looking at what other people have done. I like your picture. A small tips to others. Study the falling crystals, and if you see a excellent one, shift this under the camera lens and make a photo. You must use a fairly high aperture setting like f/11 or f/16 in order to get adequate depth of focus. However, the aperture should not be too small to prevent unharnesses due to diffraction.